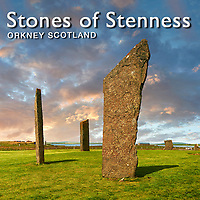 Pictures & Images of the Neolithic Standing Stones of Stenness, Orkney, Scotland. At the heart of the Neolithic Orkney World Heritage Site near Loch Harray are the Standing Stones of Stenness. Originally the monument was built as a henge with a ditch around it and the Standing Stones of Stenness circle within. The ditch has not been excavated but the Standing Stones of Stenness are the remains of probably the oldest henge in the British Isles. Originally around 12 stones formed an elliptical stone circle about 32 meters (105 feet) round. This was surrounded by a 7 meter wide ditch. At the centre of what is left of the circle is the Watch Stone which stand 18 feet high (5.5 m). The base of 2 other stones that would have stood at the centre of the circle were excavated in the 1930s. The lack of stones today was due to the action os Captain W Mackay who owned the land the Standing Stones of Stenness stand on. In 1814, angered at tourists walking across his fields to see the stones, Mackay started destroying the stones toppling the Odin Stone. This caused such outrage that he was stopped from further vandalism. Excavations from the 1970s suggest that the Standing Stones of Stenness circle was never finished. Radiocarbon dating from finds at Stenness suggest that the site dates back to before 3100BC which also makes Stenness one of the earliest henges in the British Isles.